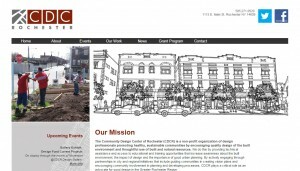 The Community Design Center of Rochester (CDCR) is a non-profit organization of design professionals promoting healthy, sustainable communities by encouraging quality design of the built environment and thoughtful use of built and natural resources. We do this by providing technical assistance and access to educational and training opportunities that increase awareness about the built environment, the impact of design and the importance of good urban planning. By actively engaging through partnerships in city and regional initiatives that include guiding communities in creating vision plans and encouraging community involvement in planning and developing processes, CDCR plays a critical role as an advocate for good design in the Greater Rochester Region.